DUBAI/LONDON (Reuters) - Iranian Supreme Leader Ayatollah Ali Khamenei said the United States had made "a vicious move" in designating the Revolutionary Guards as a foreign terrorist organization, and Tehran vowed to take action against U.S. forces in the region. "They wish to plot against our Sepah (the Guard corps) ... it is in the front line of confronting enemies of our (1979 Islamic) revolution and has always defended the country ... America has failed to block our advances," Khamenei, who controls the Guards, was quoted as saying by the state media. "In spite of all the pressure over the past 40 years, Americans have failed to do a damn thing and their vicious move will bear no fruit," Khameni said, a day after a decision by U.S. President Donald Trump that is likely to raise tensions in the Middle East. Iranian President Hassan Rouhani also defended the corps as protectors of Iran, saying in a televised speech that the United States "holds a grudge" against the Guards who have "sacrificed their lives to protect our people, our revolution". Comprising an estimated 125,000-strong military with army, navy and air units, the Revolutionary Guards (IRGC) also command the Basij, a religious volunteer paramilitary force, and control Iran's ballistic missile programs. The Guards' overseas Quds forces have fought Iran's proxy wars in the region. The IRGC commander dismissed Washington's decision and said the Guards would upgrade their military capabilities. 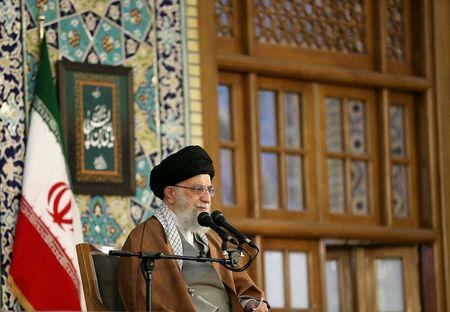 "This U.S. move was quite laughable since the Revolutionary Guards are in people's hearts ... The Revolutionary Guards will increase their defensive and offensive capabilities in the coming year," Mohammad Ali Jafari was quoted as saying by the state broadcaster. The Iranian Armed Forces' general staff, Iran's most senior military body which also oversees the IRGC, said it would "use all its means to fight" against CENTCOM, and a Guards commander on Tuesday warned the U.S. Navy to keep its distance. Saudi Arabia, Iran's arch regional rival and a Washington ally, welcomed the U.S. action on Tuesday but Iraqi Prime Minister Adel Abdul Mahdi said it "could have negative repercussions on Iraq and the region". Abdul Mahdi, speaking to reporters, said Baghdad had tried to head off Trump's decision and added that Iraq would do all it could to bring calm to the region since it maintained good relations with both Tehran and Washington. Acting U.S. Defense Secretary Patrick Shanahan told Fox News on Tuesday that listing the IGRC as a terrorist group was a policy decision by the administration and was meant to have "non-military effects," such as pressuring the Iranian economy. "We’re going to continue to work in Iraq to strengthen security forces. We recognize Iraq’s sovereignty. It’s our role in-country to build security and we’ll continue to do that," Shanahan said. Turkey, a NATO ally of the United States, was also critical. "Such decisions will lead to instability in our region and once you start stepping outside international law, it is unpredictable where it will stop," Turkish Foreign Minister Mevlut Cavusoglu told a press conference in Istanbul. In a show of support, Iranian lawmakers wore Guards uniforms to parliament on Tuesday, chanting "Death to America” as Iran marked the annual National Day of the Revolutionary Guards, the semi-official Fars news agency reported. "America's decision to label the Guards as a terrorist group was the peak of stupidity and ignorance of the American leadership," Fars quoted parliament speaker Ali Larijani as saying. Iran has so far continued to comply with the nuclear deal, but its clerical rulers have threatened to withdraw from it and to resume the suspended Iranian uranium enrichment program if other signatories to the pact fail to protect Iran's interests. "I am telling you (American leaders), if you pressure us, we will mass-produce IR8 advanced centrifuges," Rouhani said in the speech marking Iran's National Nuclear Day.